Colorful Easter eggs are the most identifying feature of this holiday! Make your own with this easy and bright Paper Quilling Easter Egg Craft! Most major holidays have theme colors – red, green and white for Christmas, orange and black for Halloween, green for St Paddy’s day and so on. But Easter is one holiday where colors don’t matter – and nothing proves this better than bright and colorful Easter eggs! One of the best things kids love about an Easter egg hunt is ending up with a basket full of colored eggs – such a pretty sight! And that’s what we’ve decided to make today; not a basket of eggs in different colors, but a single egg with many colors! 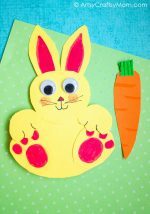 This Paper Quilling Easter Egg craft is a great project for quilling beginners, since they can learn to make basic shapes like loose coils, tear drops and lens shapes. 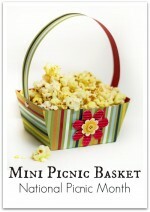 The rest of the craft is fairly simple, with the focus being on quilling. 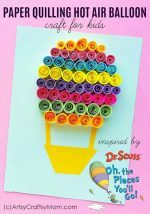 So if your kids have been wanting to give quilling a try, this is perfect for them! 1. Select paper quilling strips in multiple bright colors. With these, make 3 different shapes – loose coils, teardrop shapes and lens shapes. We’ll need more of loose coils and the other shapes will be to fill in the gaps. 2. Trace the egg template on a piece of thick craft paper and cut it out neatly. Apply glue on places where you would like to add your quilled coils. 3. Start sticking the quilled shapes on the egg cut out straight away. Start from the top and move down, pressing the quilled shapes gently on the egg. Try to level the quilled shapes with the border of the egg. 4. Continue to add the quilled shapes till half the egg is filled. Then go to the opposite end of the egg and start moving upward. 5. 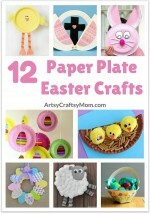 Use the lens shaped quilled pieces at either end of the egg. Use the teardrop shapes to ensure the coils stay within the egg shape. 6. Once you’re done filling in the entire egg, allow the glue to dry completely. 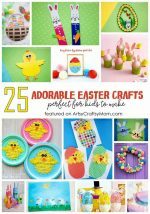 If you enjoyed making this craft, you can add some more colorful eggs to your collection – an Easter Egg Button Wall Art and a Quilled Bunny Easter Egg Craft. And if you’d like ideas to decorate some real eggs, our list of Eggciting Decorating Ideas should provide enough inspiration!